Brutalist brilliance: Francesca Peschier reviews Chris Bush and Richard Hawley’s sweeping musical ode to Sheffield’s Park Hill housing estate. Nicole Deon in Standing at the Sky’s Edge at Sheffield Crucible. Design, Ben Stones; lighting design, Mark Henderson. Photo: Johan Persson. Despite having repeatedly informed him throughout our marriage that I like a grand total of four bands*, my musical philistine-ness never seems to fail to amaze him. Listening to Hawley shake through the floor, I could appreciate the bassline and storytelling, but overall it was leaving me cold. Maybe because I was running late, maybe because I have about the musical palate as a goldfish, but whilst I was looking forward to Standing at the Sky’s Edge, I was in it for the theatrics not the source material. Not since I was about a year late to Girl from the North Country because I don’t like Dylan** have I been so very, very wrong. I now consider it my duty to eulogise grandly on Hawley’s genius. The inherent poignancy of his lyrics and the otherworldly swooping melodies match up beautifully with the mythologising magic of playwright Chris Bush. Her book and his music come together to make poetry out of the Park Hill estate, the concrete housing development that dominates Sheffield’s skyline. Like other controversial brutalist wonders such as Balfron Tower or Croydon’s 50p tower it was built with best intentions, its incredible views and ‘streets in the sky’ offering an alternative to the city’s worst slums. From a place of hope, it degraded into a dangerous, run down estate before regeneration gave it new life, although for whom remains in question. In Social Housing in Performance: The English Council Estate on and Off Stage, Dr. Katie Beswick demonstrates how (and apologies to Dr. Beswick for the humongous simplification) stagings of social housing can fall into using a shorthand for working class authenticity or ‘realness’ which can be classist to a point of separatism. She problematises the NYT’s 2011 Slick, staged at the same Park Hill estate, in that the ‘material reality of the site’ allowed audiences to visit a ‘”real” council estate and views over post-industrial Sheffield without the threat of encounter with estate residents’ (Beswick 2019). 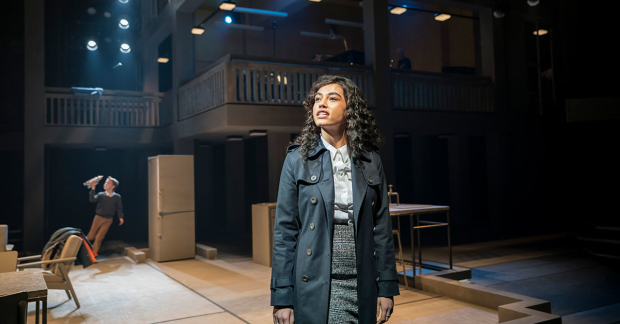 What Hawley and Bush have done, with lashings of help from designer Ben Stones’ stunning interpretation of Corbusier’s style lines and storeys and Mark Henderson’s so-sharp-you-could-cut-yourself lighting, is wondrously contrary. They ground us in the unreality of Park Hill through the lives of those that live and have lived there. The human heart is astonishing in that it can transform any building, any ‘box to keep the rain out’ (as one character puts it) into something worth watching nearly three hours of song and dance about. We follow three families (as in sets of people who love each other, as opposed to necessarily biological) from the founding of the estate to present day. They are interconnected, not just by the walls they share but by loves, oppressions and wants that transcend decades. Bush is unafraid to mix the hilarious with the uncompromisingly political. She takes in everything from the steel pit closures to the Liberian civil war to the gentrification of gin in her capable stride. And the music. The music is just superb. In a cast that shines and sounds like this, really the person who should be singled out is the rarely praised casting director. Stuart Burt has managed to build an ensemble around the stunning leads that act like a golden frame around a Caravaggio – complimentary but gleaming in their own right. Faith Omole is transcendental as Joy, embodying her over-twenty years of struggle, heartbreak and happiness. Rachael Wooding shrugs off every resilience-in-lipstick working class woman cliché that her 60s housewife Rose could have been and gives us something so much more interesting. The musical is animated by Lynne Page’s versatile choreography, taking it from ‘very good’ to something just short of sublime. Page’s work moves from fully balletic, stage-filling wonders to tender, zoomed-in moments. A reccurring motif sees the cast rewind and repeat small instances: checking you’ve locked the door, dancing to a Walkman along the 3rd storey skyway, offering another drink. It’s not clear if these are reminders of the hundreds of itinerant moments that make up a life or a focusing in – a reminder that here too, in our everyday mundanity, are we really, truly living. *Nick Cave, Dolly Parton, Janelle Monae and Sisters of Mercy. Honestly, covers about all bases. ** I know, I know. Ok it’s not strictly true, I like Bob Dylan songs sung by almost anyone who isn’t Bob Dylan. Go watch the video to the ‘original’ (e.g. ‘not Shelia Atim’) Tight Connection to my Heart and then come fight me. Standing at the Sky’s Edge runs at the Sheffield Crucible until 6th April. More info here.